The first real test of my Casio EX-Z80 was this weekend, when I did the ocean part of my PADI Digital Underwater Photography class. We did two dives in Monterey at McAbee beach (down by El Torito on Cannery Row). I have to say, I'm relatively pleased with the pictures, but there are a few aspects of the camera itself that did annoy me during the dive. First the fun stuff! Here's footage I took with the camera of me being "checked-out" by a friendly harbor seal. I didn't know he was there, but my dive buddy motioned to me to look behind me - we were just coming to shore at the end of the 50+ minute dive). 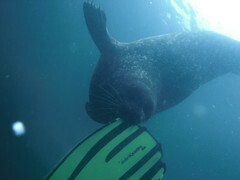 When I looked round there was the seal attacking my fins. I dropped the Casio back into Auto Exposure and fired up the video recorder. I'd tried taking the still shots of the event first, but I found that the picture review mode severely inhibits the ability to do a burst of photographs of a single event, so I'll be turning that off in my profile before the next dive. I found it rather annoying that I can't just start video recording when I'm using the Best Shot mode that I have set-up for underwater photographs. Fair enough that it's not possible to use the BS mode, but rather than just refusing to switch to video mode (forcing me to manually revert the exposure mode to Auto) why not give me the option to immediately override the exposure mode back to auto! Another thing I don't like about the camera is that it reverts back to auto exposure after 'auto off'. I found that every time I wanted to take a picture the camera had switched itself off and I needed to go back to BestShot|UserDefined|Select. It was very cumbersome to do this with 7mm gloves on. Eventually I turned the AUTO OFF setting to 5minutes, which definitely helps but isn't a perfect solution. It's rather annoying that the Best Shot mode doesn't remember my preference for ISO setting. When activating the BS mode, the camera always goes to Auto ISO generally the same as "use the lowest ISO you can at the expense of slower shutter speed". What I found was anything with a shutter speed slower than 0.002seconds would be blurred, so it's definitely better to go for a 400ISO and faster shutter speed and live with the additional picture noise.